Teamwork means making one’s skills, experience and expertise available to benefit everyone, so as to make progress in the world. It does not mean keeping to oneself the talents that we have been lucky enough to receive. We must combat such isolated ways of working. Through new models and new incubators, Ahimsa Fund aims to develop a new leadership and forums for discussion and meetings, whereby everyone benefits from interaction with others and everyone can contribute to changing the world. Ahimsa Fund supports women leadership and develops, with local partners, new business models to help underprivileged populations developing skills by enhancing the value of entrepreneurial actions. 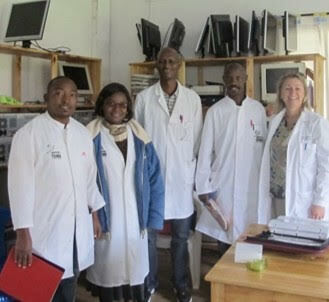 The final purpose of such an approach is to allow to contribute to finance health programs for these populations. Several initiatives deserve to be highlighted, from education to healthcare access and particularly prevention of infant mortality, but also de support for professional integration, these women, that Ahimsa Fund has met and with whom we work day to day, commit themselves, every day, to change the World. A focus on outstanding actions developed for the underprivileged. Marguerite “Maggy” Barankitse, is an exceptional Burundian. Maggy is a woman following in Mandela’s footsteps, giving heart and soul so that the children of Burundi will have a future. President of the NGO Maison Shalom, she involves herself to allow children and refugees to believe in a better future by helping them to have access to professional training. She founded the Maison Shalom community center in Kigali, called Oasis of Peace. This special place allows people to meet, to train themselves to professional crafts: from sewing to real Art but also culinary skills, embroidery and drawing, and last but not least computer training. The Oasis of Peace was inaugurated by Maggy on May, the 9th, 2017. Every year young burundian refugees are trained and will be able to create their own business in order to afford their health expenses. 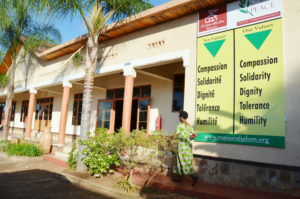 Ahimsa fund supports Maison Shalom in the development of a bigger sewing workroom, in the Oasis of Peace, for burundian refugees in exile in Rwanda. Runa Khan has been fighting for more than 10 years for the poor, transforming boats into hospitals. 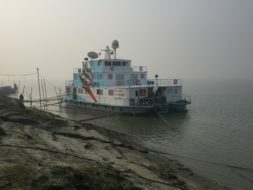 She founded the NGO Friendship, in a region north of Bangladesh, along the Brahmaputra River, where natural disasters are regular and make living conditions precarious and unsustainable for residents. The actions of Friendship began, to respond to the emergency, to relieve the victims of these disasters by creating hospital boats to allow them access to healthcare. Over the years, development aid has been considerably structured and covers all aspects of this approach: health, education, economic and agricultural development, access to energy are the main fields of action. Ahimsa Fund supports Friendship in the implementation of cervical cancer screening for Bengali women. 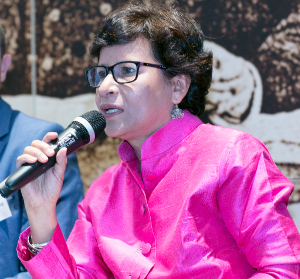 Zelma Lazarus, Executive Director of Impact India, fights every day for the poor: “Impact is using existing infrastructure and routing solutions to focus on prevention and treatment”. Zelma explains. Impact India Foundation has created the Train of Hope, The Lifeline Express, a hospital train that has been circulating in India since 1991 and deals with very different pathologies (cataract, hare beak, orthopedic disorders, cancer …). But Zelma Lazarus is also fighting to reduce infant mortality. Many newborns in the city of Palghar, north of Mumbai, are dying of cold. A local custom wants that the umbilical cord is not cut until the placenta naturally separates, this can take more than an hour. Many babies die of hypothermia, and the most disadvantaged mothers can not afford to buy blankets to protect them during the first hours of their lives. Zelma Lazarus, makes herself, every week, several covers, also called Baby Wraps. Zelma educates schools but also the wealthiest families in India to accompany it in the manufacture of these blankets. More than 1000 blankets were distributed and saved the lives of infants. Ahimsa Fund participates in various health projects on the Life Line Express. Internationally known for he painting and writing, Countess Setsuko Klossowska de Rola has played a major role in raising the awareness of students and teachers around the world for World Heritage conservation. Very committed to UNESCO, this talented artist has been particularly involved since 2002 in the World Heritage Youth Education Program (cooperation project between the UNESCO World Heritage Center and the School System Network from UNESCO). 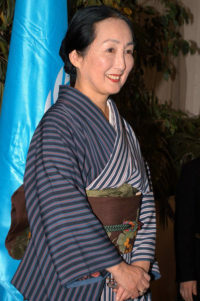 Countess Setsuko has not hesitated to travel extensively to promote a World Heritage Education Kit for teachers, she has been welcomed in the Ministries of Education of several countries. 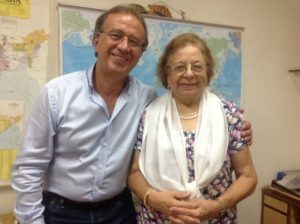 She has been a member of the jury of the international school contest, the Mondialogo School Contest, launched by DaimlerChrysler and UNESCO, to promote intercultural dialogue, exchange, respect and tolerance. It is the first worldwide contest dedicated to students involved in intercultural dialogue. 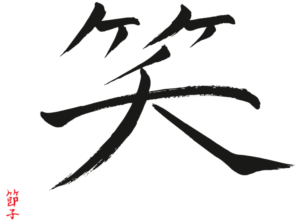 As an Artist for Peace, Countess Setsuko offered to Ahimsa Fund, during the last Forum 2017, the creation of an exclusive calligraphy, representing the smile. Medicine (CCTM) and recently she was elected for the executive members of CCTM and currently serving as a General Secretary of CCTM. Dr Tsering Tsamchoe travels around the world and invests her time to promote Tibetan Medicine and its clinical benefits. The Central Council of Tibetan Medicine, for which Tsering Tsamchoe is General Secretary, works with Ahimsa Fund to give a special support to the tibetan communities, particularly a cervical cancer screening project. in bladder. She has also contributed in many little studies in her university centre. In addition, she has acquired a rich experience of humanitarian work that began in Haiti in 1993. Since then, she travels around the world to participate to humanitarian initiatives for low-income countries (Nicaragua, Mozambique, Burundi). Her main objective is to upgrade the health care for women. 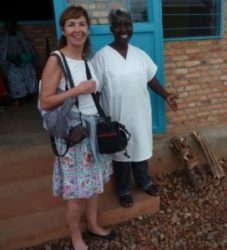 Marlène was part of the Ahimsa Fund project developed with Maison Shalom regarding cervical cancer screening at the Rema hospital in Rui Ruyigi, Burundi in 2014, we work together on news projects to come very soon. Brigitte Bouyala is an artist from Marseille(France), she has been working with Ahimsa for several years, she has participated in various projects in Africa but also in the Ahimsa Fund Forums, to make these events unique and highlight the best moments. Brigitte Bouyala realizes regularly exhibitions, in various places (Foundations, Hospitals, Private Places …) around various themes (women in the world, unusual places, …) around the world. Her photographs are presented in various forms garden canvases, bags and tote bags and can convey values. Dr Kaosar Afsana has been working for BRAC for 24 years. Currently, she is the director of health, nutrition and population. She is a professor in James P Grant School of Public Health, BRAC University, Bangladesh. Dr Afsana is an MD with an MPH from Harvard University, USA and a PhD from Edith Cowan University, Australia. 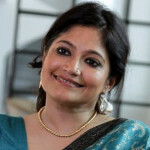 She has many prestigious awards including the Woman of Distinction Award 2011 by the NGO Committee of the Women Status (New York) for her contribution to maternal health and women’s empowerment; Presidents’ Prize for the best thesis on an Asian topic by Asian Studies Association of Australia; D.K. Agencies India’s award for the best Australian doctoral thesis on an Asian subject; the 2003 University Research Medal and the Faculty Research Medal for the best PhD thesis from Edith Cowan University. Dr Afsana was part of the Ahimsa Forum speakers, she shared her experience and the BRAC projects she developed and exchanged with the local communities and international organisations participating in the Forum. Ahimsa Fund works with Kaosar and BRAC on a social entrepreneurship approach. Her focus: innovative leadership challenges, strategy development and implementation of initiatives that aim to connect, support and empower co-creation among social entrepreneurs, industry and public/local NGOs/academic world. Manuela has a rich experience with many years spent in the digital area in the modern international business world, followed by a huge social entrepreneurial experience around the globe. Her best learning ever? An ongoing social entrepreneurial project in rural South India, in collaboration with local NGOs, the Boerhinger Ingelheim business people and simple village people. Facilitating community building across the traditional borders and employee engagement for making social impact that creates a win to all. Manuela has a huge interest in identifying shared value approaches with focus in the health sector. Facilitator of multicultural project teams, Manuela has large international communications and teaching skills. Bottom up approach, personal exposure to listen and learn, start small – grow big, focus on doing instead of talking – that’s what she believes in. Manuela has many years of experience in Corporate communications/ digital marketing/ development of international Internet strategy including trainings concepts and building community of digital experts for international pharma company. Change management experience. Key speaker at international congresses. CMS business-driven set up in close collaboration with IT, training programs on digital topics for product manager. Manuela hosts many international congresses, she participated to the 2017 Ahimsa Forum where she shared her vision and field experience. Ahimsa Fund and Manuela work on various social entrepreneurship projects.